Hey, y'all! Yesterday, we woke up to an unexpected two hour delay for school and from that experience, I really think school should start two hours later every. single. day. My children weren't grumpy and neither was I, lol. I think this might be the solution to our crazy mornings! Today, I'm rounding up outfits from last week on Instagram. So much pink, black, denim, and gray, you know, the usual lineup for me. My closet is color coordinated and the gray section is by far the biggest! I love some gray! Which color do you have the most of in your closet?! 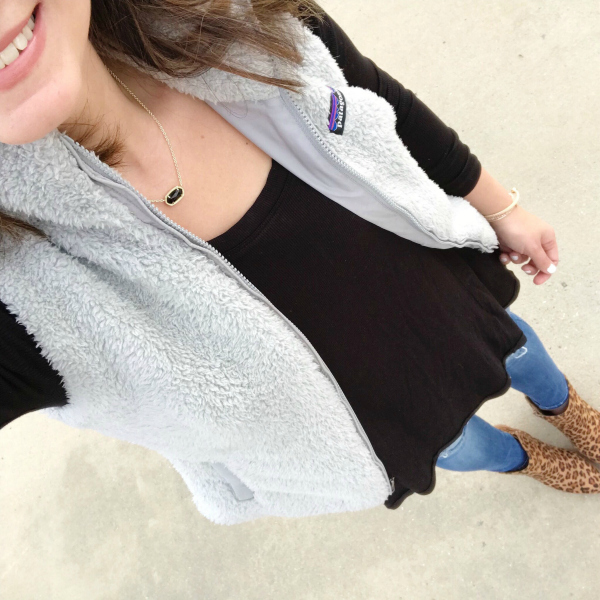 I wore this outfit for a little date night with my husband. We only had a couple hours to ourselves but we always try to make the most of it. Dating your spouse is essential! 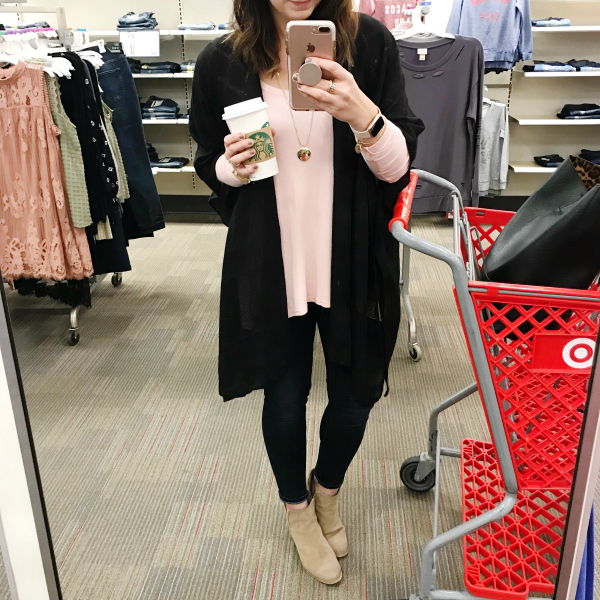 I am loving all of the new pieces in the Universal Thread line at Target, especially this versatile ruana wrap. The full line launches on Sunday and I can't wait to style more of the pieces for y'all! 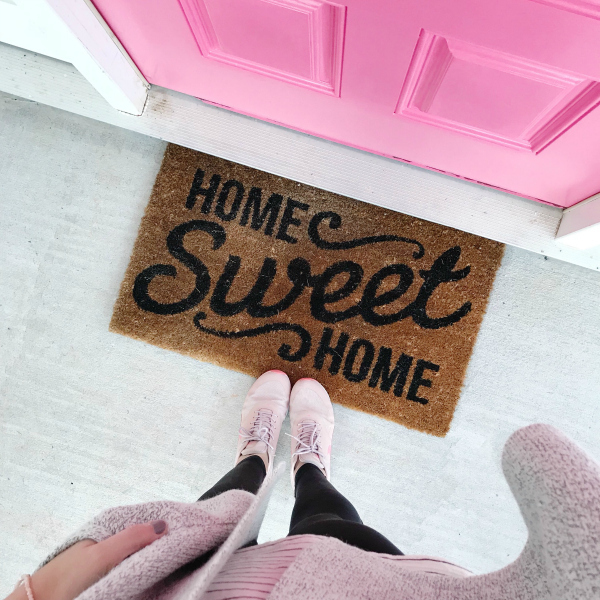 This Home Sweet Home mat is back in action and it's always my favorite. It's also super budget friendly at around $11! Sometimes classics are just the best. 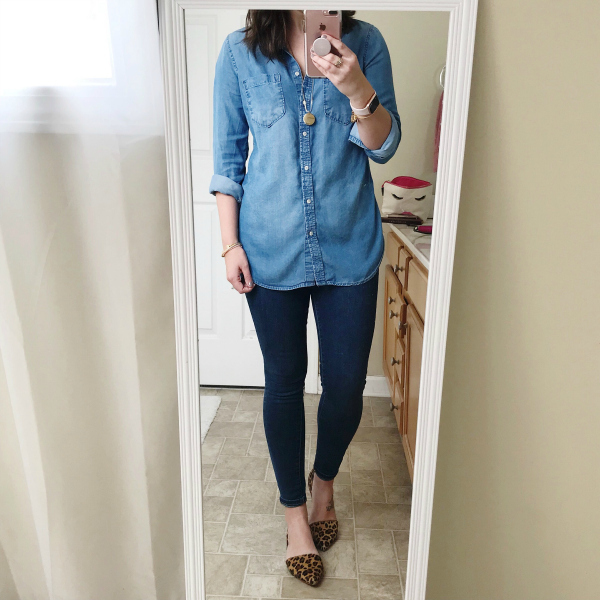 Chambray shirt, dark high waisted denim, and leopard flats when I was in a style rut. When you don't know what to wear, wear what you love. 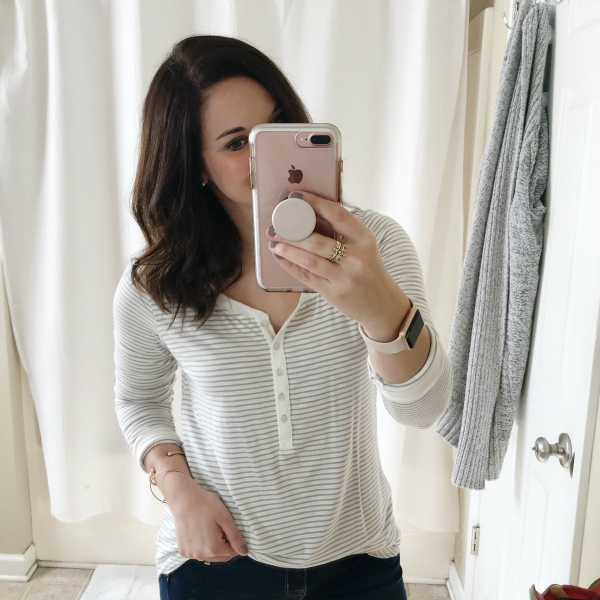 I have been loving this henley tee! It's so soft, comes down a little longer in the back (so it works with leggings), and it has thumb holes! I sized up to a medium for a more relaxed fit. Hello, mom uniform. I debated on this top for months but finally decided it needed a home in my closet and I'm so glad I got it. It's one of my current favorite tops because it can be dressed up or down. 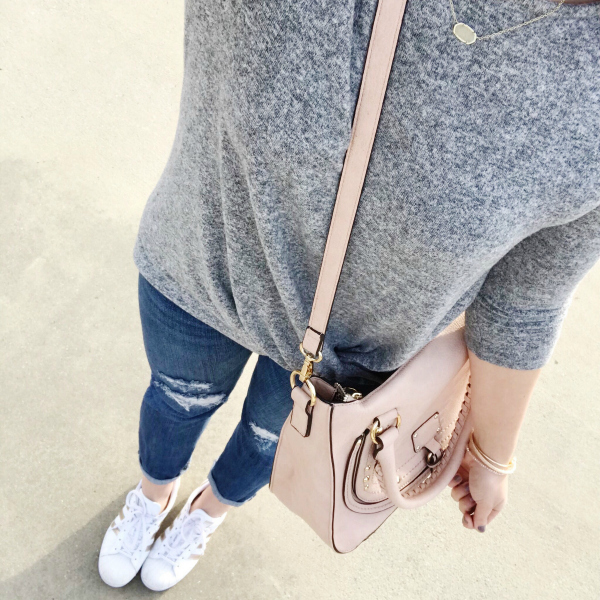 A no fuss top, comfortable denim, and sneakers is one of my favorite go-to mom looks. Isn't this graphic tee fun?! 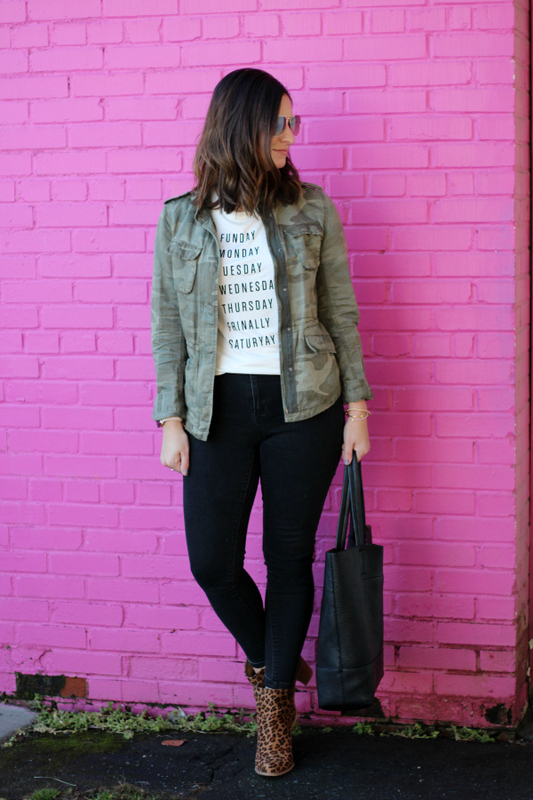 I love pairing graphic tees with cardigans to dress it up a little bit. 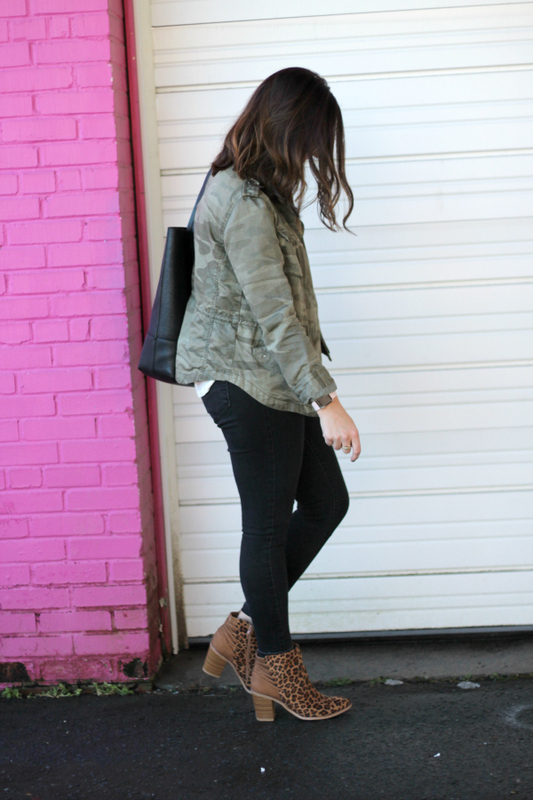 I added my new leopard boots to this look for a fun pop of pattern. This top is my very favorite right now! I also own it in black (see first photo) and it's just so flattering. The top is fitted and the body is super relaxed. Such a great top and worth every penny. Kind of thinking I need to go ahead and hunt down a gray one! Hey y'all! I hope your week is off to a great start! This time of year I kind of don't want to buy anymore winter clothes but it's just too early to start purchasing pieces for spring. So I either find transitional things that can work now and later or I skip clothing shopping all together. But this season, I'm also really excited about beauty products. I'm not a beauty expert by any means but I am a real woman who loves to try new products that make me feel and look better. So today, I'm sharing six products that I recently picked up from Ulta Beauty! 1. Mascara | This mascara is a regular restock for me. I switched to this mascara from one that costs twice as much last summer (you can see my splurge vs. steal mascara review here). Mascara is a big part of my personal makeup routine so finding one that I love is a must. This mascara is under $10 and gives your lashes so much volume without being clumpy. I personally do not like the waterproof version of this mascara because it's super difficult to remove. I use the regular formula in the color black every single day. I don't think I could spend $20 on mascara again! 2. CC Cream | I have been wanting to try this CC Cream for a really long time and I love that it contains SPF. I've heard great things about it but the full size version of $38. Spending that much on a small tube of makeup seems like an investment to me and I really want to make sure I love something before I spend that much on it. So I decided to get the travel size that is about half the size and half the price to get it a try before I purchase the full size product. I do this anytime a small size is available before committing to spending $30+ on a beauty product. 3. Mask | I recently tried the facial spray from this same brand I absolutely loved it. This skincare line has so many unique products and I can't wait to try more so I ordered this mask. I love using a facial mask at least once a week. I'm so excited to give this one a try! 4. Dry Shampoo | If you read last Tuesday's post, then you know how important dry shampoo is in my hair care routine. I typically use a pretty inexpensive dry shampoo but I wanted to start testing out a variety of different ones so I could let y'all know which ones are really worth the money. I am starting out with this one from Living Proof, also in a travel size version. I'll let y'all know what I think of this one soon. It has amazing reviews on Ulta's website so I have high hopes! 5. Hair Ties | I also mentioned these hair ties in last Tuesday's post and I grabbed another pack of them because I love them so much. These hair ties are life changing! I know that sounds kind of silly because I am referring to something that ties your hair back but really, they are great! They don't pull your hair out or leave a crease in your hair when you take your hair down. These are also really great for thick hair. They securely hold my hair in a ponytail or a bun! If they get stretched out, you can regain their shape by putting them in mug of hot water. These are a must have hair product! 6. Lip Gloss | I already own this lip gloss in the shade tiramisu, which is the perfect neutral color for everyday wear. I wanted another color and I love this strawberry cheesecake shade. These glosses are semi sheer so they aren't too intense, they make your lips feel so soft, and they smell so good! Hey y'all! I hope you had a great weekend! 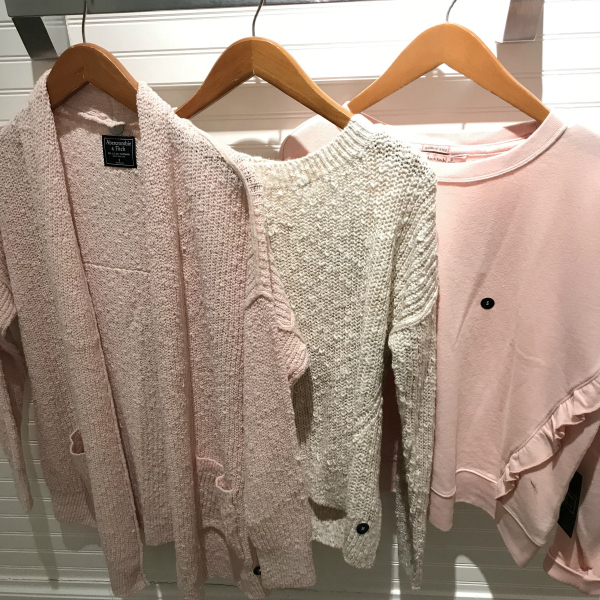 I have shared pieces from Abercrombie & Fitch here on the blog and on Instagram but I have only been inside the store twice in the past 10+ years. Y'all, the place still smells exactly the same. That crazy strong smell of cologne that about knocks you over as soon as you walk inside of the store. Yep, it's still there. I'm pretty sure it just comes out of their central air conditioning system, lol. But what has changed is the style of the clothing! They still have their infamous A+F logo scattered on tees and sweatpants but overall, the style is more mature and put together than it used to be. The color palette is also perfect! Grays, pinks, and neutrals seem to be the pattern as you walk through the women's section of the store. So yes, it's now the perfect place for thirty something moms, too! This cardigan was one of the first items I saw when I walked in and the color caught my eye right away. 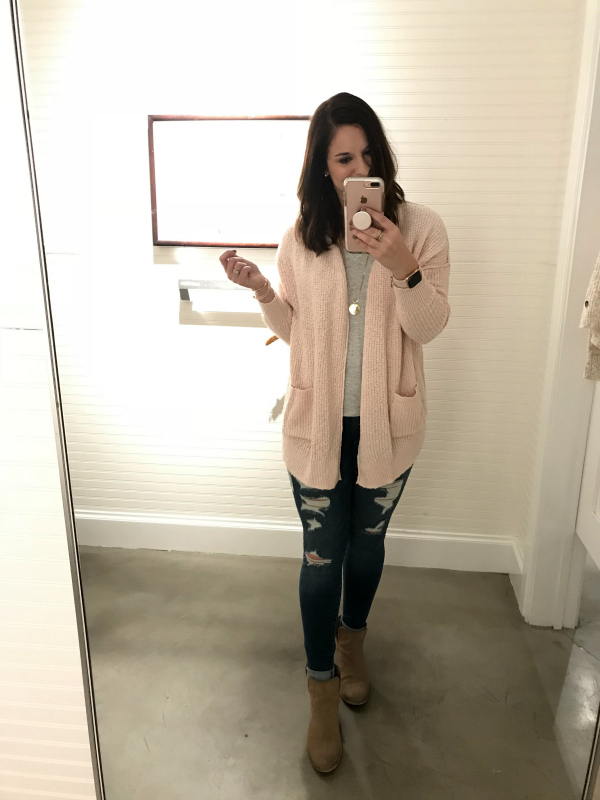 I love cardigans and a blush pink one has been on my list. I tried this one on in a size small and I found that the fit was true to size. 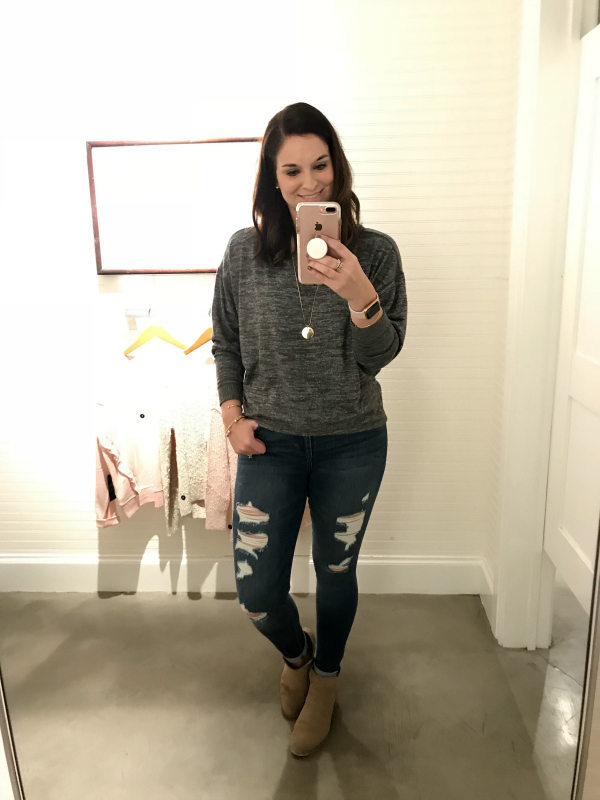 If you love high waisted jeans then you will absolutely love the ones at Abercrombie! The fit is perfect and they are so comfortable, too! I found the jeans to fit true to size. 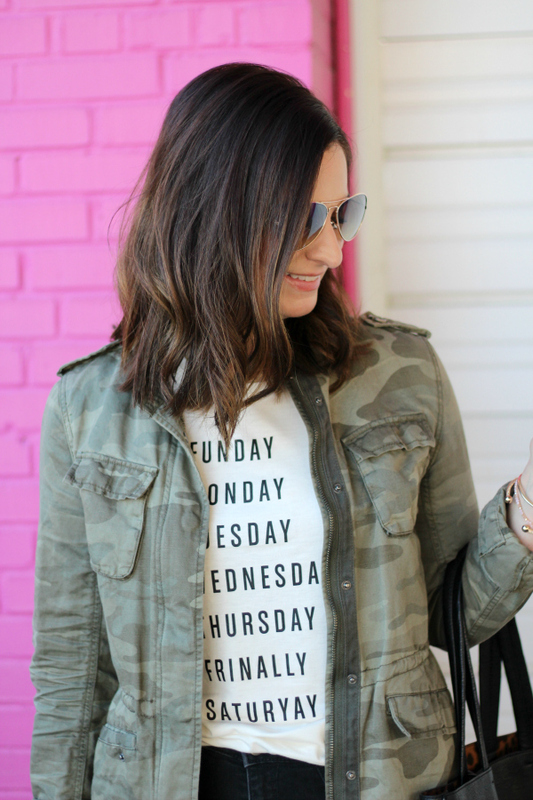 I love the color of this camo tee! I couldn't find this v-neck version online but I linked the crew neck version below. The tee also fits true to size. 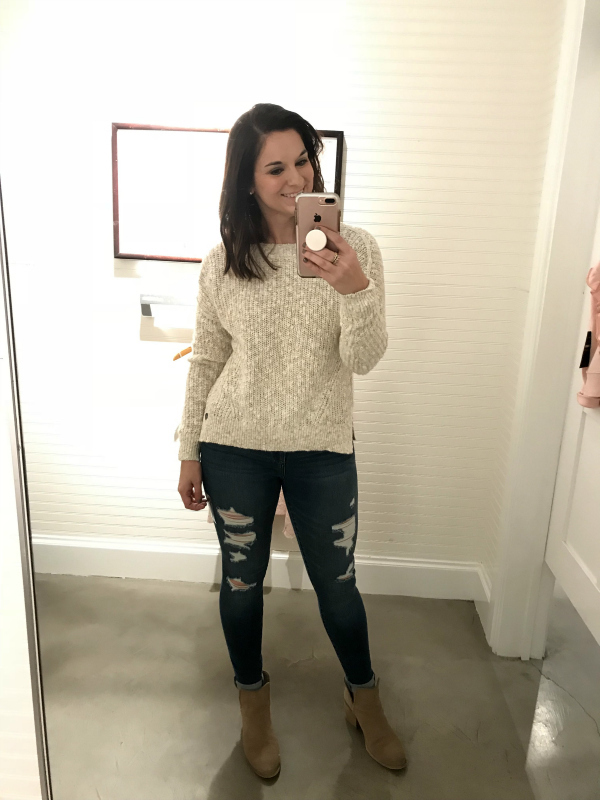 I love neutral sweaters like this one that can transition perfectly into spring. I sized up one size for this try on but I think if I were to purchase this, I would size up two sizes for a more oversized fit. Don't be afraid to size up to get the fit you are looking for in clothing. Size is just a letter or number. 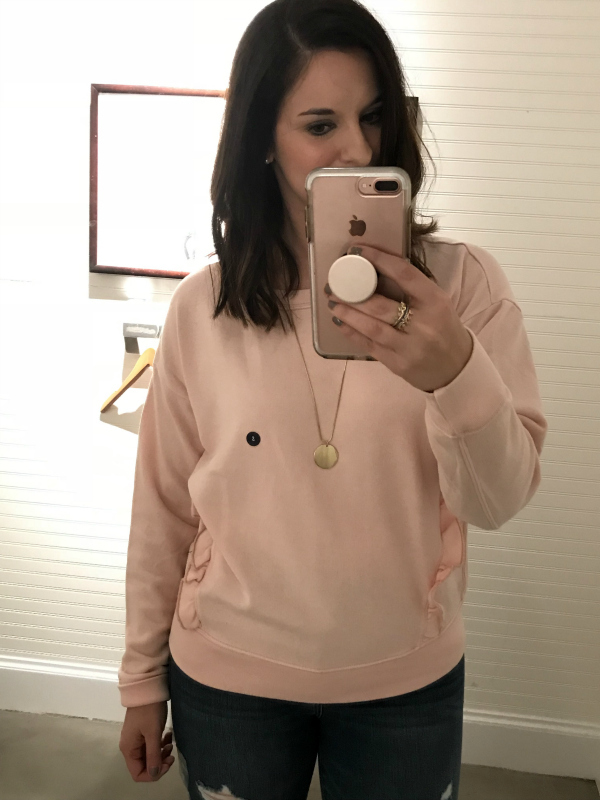 This soft sweatshirt is such a fun, comfortable piece for your wardrobe. It's another great piece that can be worn now while it's still cold outside but would transition perfectly into spring by adding shorts or sandals to the look. This sweatshirt fits true to size and I'm wearing a size small. 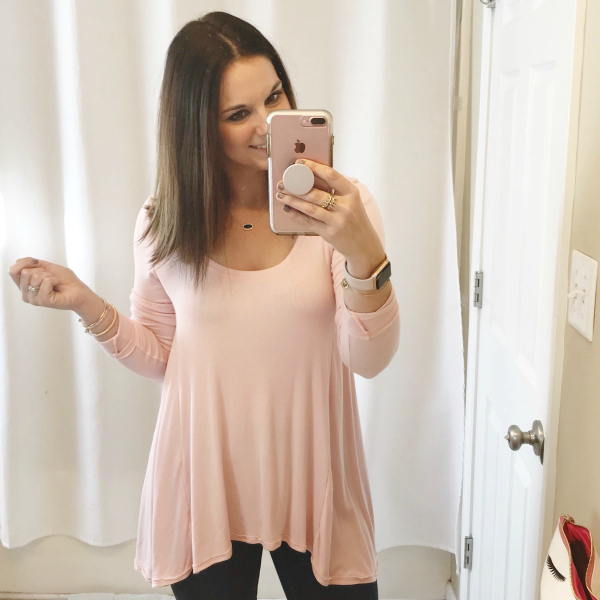 If you love to be comfy, then you will need to try this top on for yourself! It's so soft and I love the relaxed fit. It's slightly shorter than I normal wear but I love it paired with these high waisted jeans. I tried on a size small and I would say it fits true to size. Happy Friday! I hope you've had a great week! Today, I am rounding up what I am currently loving and no your eyes aren't playing tricks on you. Yes, that is a swimsuit and yes, it is January. I'll explain why I am sharing this fabulous swimsuit with y'all already below! 1. 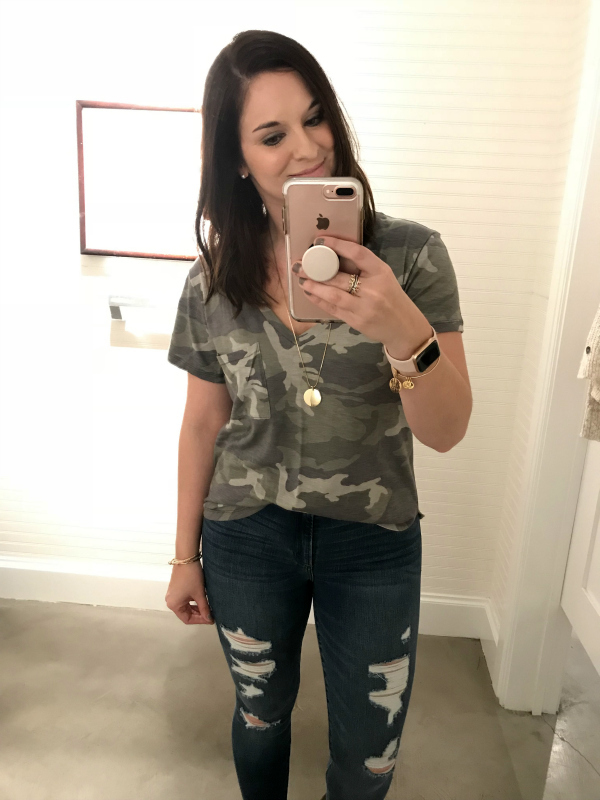 Denim | I tried these jeans on in this store yesterday and they are amazing! I am currently loving high waisted denim and these are great. I am 5'5" and the regular length was a little too long on me. I would recommend going with the short length if you are my height or shorter. They also fit true to size. If I didn't already own too many pairs of denim, I would have definitely purchased these but I know where I will be getting my next pair of jeans. 2. Striped Top | I am always drawn to stripes! I love how versatile this top is. It would look great pulled up as a cowl neck with skinny jeans now or worn off the shoulder with shorts later. 3. 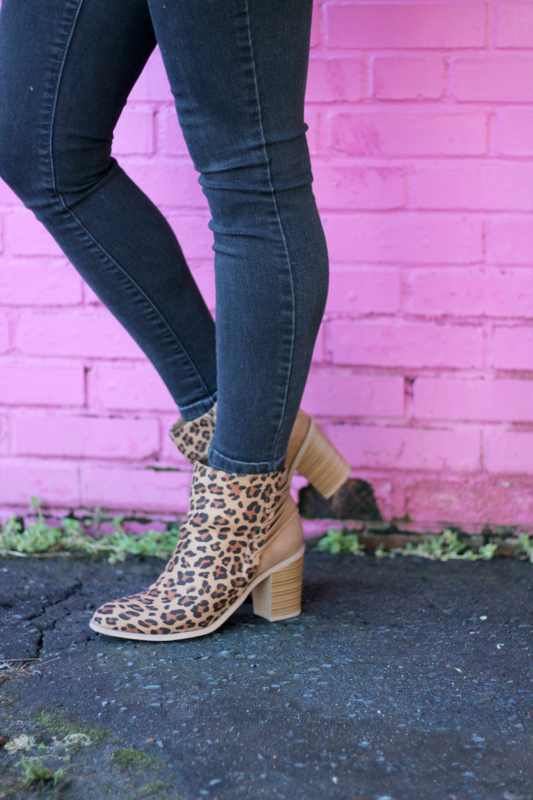 Ankle Boots | How cute are the details on these ankle boots?! They are under $35! 4. Sneakers | I love Nike Flex sneakers! They are seriously so comfortable. I wore a similar pair to walk all around Disney and I had zero discomfort. They are a must have if you are looking for a comfortable yet stylish pair of shoes! 5. 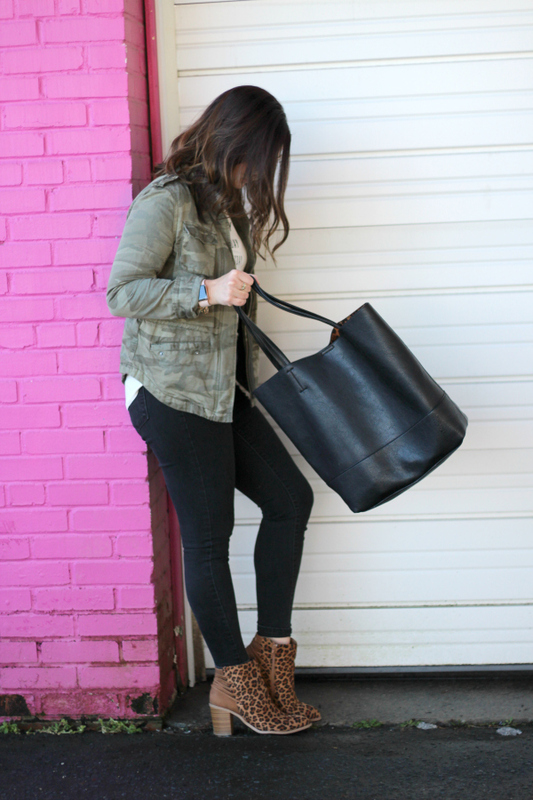 Tote Bag | Y'all know I love pink so I immediately added this bag to my wish list when I saw it in pink! I love nylon bags because they super durable and last forever. 6. Rain Jacket | I had planned to purchase this jacket in black but then they came out with this gorgeous shade of pink! Now I can't decide to go basic with black or mix it up with this pretty pink. 7. Ruana | This ruana was one of the early releases from the new Universal Thread line at Target (the whole line will be available in store and online on February 4). I ordered this Sunday and it arrived on Tuesday. I wore it yesterday and I absolutely love it. Definitely a classic piece that you can wear so many different ways. You could even use it as a chic swimsuit cover up this summer! 8. 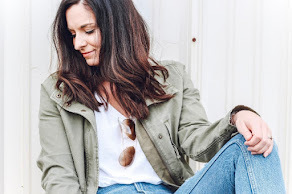 Lip Gloss | I have seen several of my personal favorite bloggers share about this lip gloss in this pretty neutral shade (tiramisu) so I decided to give it a try. It was only $5 at Target and it is seriously the prettiest color! I love the glossy formula that doesn't dry out my lips. 9. Swimsuit | So, why am I sharing a swimsuit with y'all in January?! Well, the obvious first answer is that it's perfect! I fell in love with one piece suits last summer and my love continues this year. I love that you can still feel modest yet not completely covered in this suit. And, it's black. I always prefer a black swimsuit! I am purchasing this swimsuit now because I am kind of afraid it will sell out and also, it gives me motivation to stay healthy! If I have this great suit to look forward to wearing, I am way more likely to actually get myself to the gym on a regular basis, lol! Hey y'all! 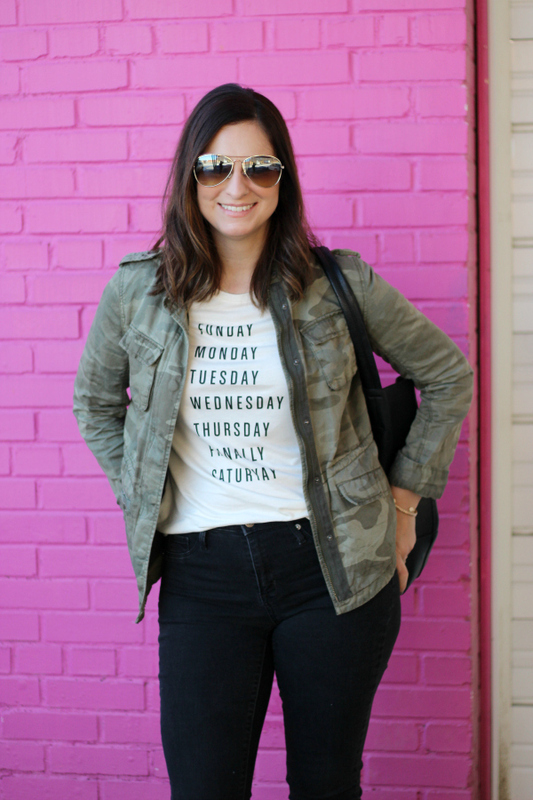 Today, I am sharing how I recently styled a graphic tee. I rarely buy graphic tees. Words on my shirt typically isn't my thing and this probably has a lot to do with the fact that I wear a t-shirt to work four out of seven days a week. But, as soon as I saw this one, I knew I needed to have it! 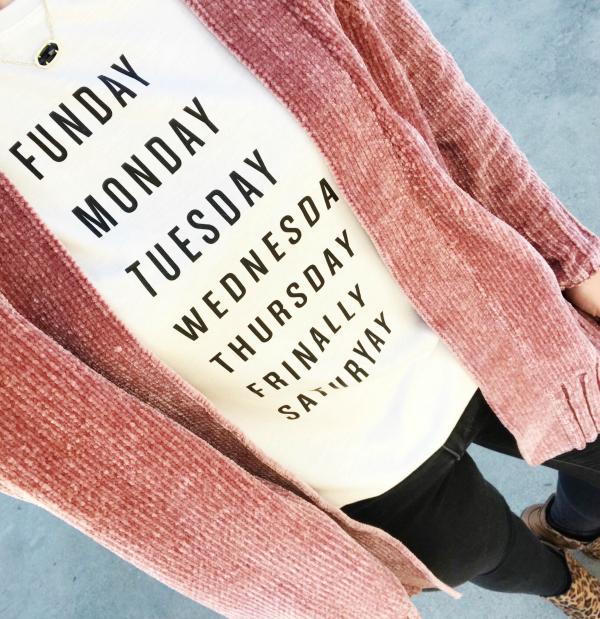 I love the neutrals colors so I thought it would be easy to style many different ways and bonus: you can wear this tee any day of the week! I wore this graphic tee to shirt on Sunday with a cardigan and I couldn't figure out why everyone was staring at me. Well, turns out, they were just trying to figure out what in the world my shirt said, lol. I switched up my cardigan for a little edgier look. Camo and leopard is one of my current favorite pattern combinations. I don't pattern mix quite as much as a I used to because I feel like my style has shifted to a more simple look but I love this surprising and unexpected combo of prints. I sized up to a medium in this tee for some extra length for front tucking and knotting. The style of this tee is flattering while still being a relaxed fit. 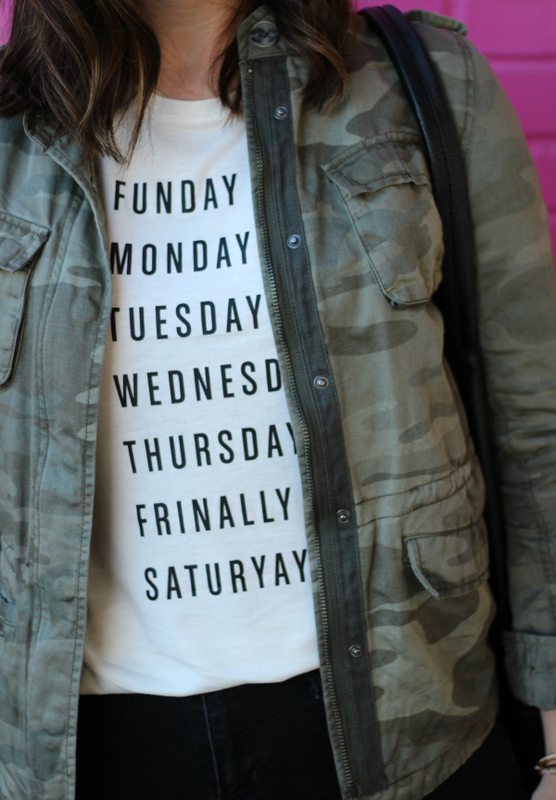 I'll be wearing this tee non-stop until further notice.